As we all know, I love all things scented...well almost all things! I have candles and wax warmers all over my house, and usually not the same fragrance. Megan, the Owner of The Waxy Dachshund, does too! She has creatively combined her love for scent with the passion she feels for her Dachshunds, Hank and Penelope - hence the name The Waxy Dachshund! After months of trying to find the perfect balance for the perfect candle, Megan finally found the desired blend for her hand poured candles! Because these candles are made with a blend of soy and vegetable waxes, they burn more evenly and for longer. They also create a more clean burn. You can expect your 9oz. candle to burn for roughly 50-60 hours. As well as being a long lasting, beautiful and clean candle - these candles have the highest amount of fragrance oil possible put into them. Did you hear that? You can actually smell them! How do I know? Because I was allowed to review a candle! After a good while of searching through the candles and having a hard time choosing which scent I wanted to try, my husband chose the Black Cinnamon Candle for me. I am sure glad he did too, because we love this candle and have received so very many comments on it. 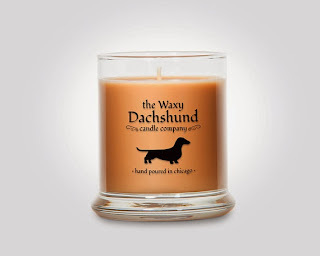 The Waxy Dachshund is always evolving and trying out new scents, which is why they have over 50 to choose from! Among those, right now, are 9 seasonal holiday scents! From Fresh Cut Grass to Cranberry Sauce and even your classics such as Vanilla - The Waxy Dachshund is sure to have a candle that will leave your home smelling so delicious that you want to get out of the house, just to come back in! Visit The Waxy Dachshund to view the many scents offered to you!